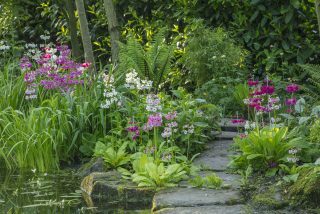 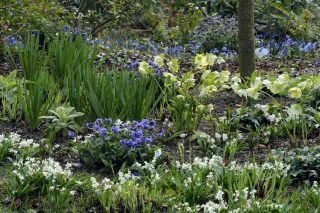 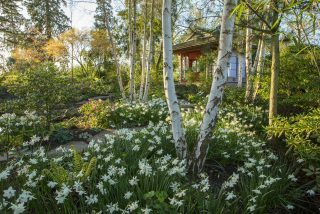 Across the drive, the journey continues along a bark mulch path between two borders planted in a restrained palette of whites and blues: Dainty bamboos, scilla, camassias, Iris sibirica, francoas and hydrangeas are framed by silver birches and evergreens. 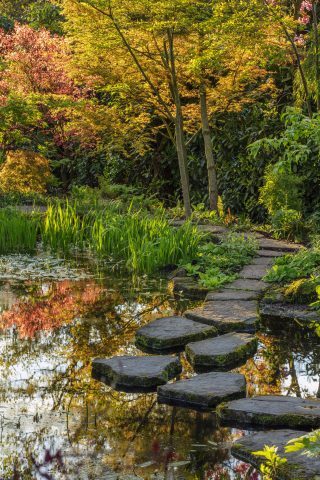 The path emerges onto the lower of two ponds that take their inspiration from a traditional Japanese garden style, the Stroll Garden. 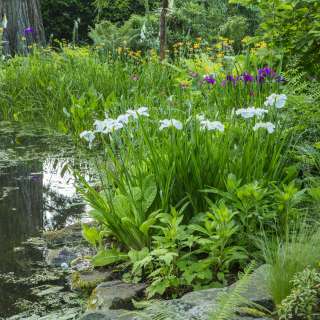 The canopy of large oaks, cedars, and a majestic wellingtonia are reflected in the still surface of these pools. 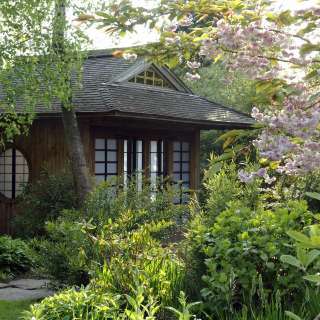 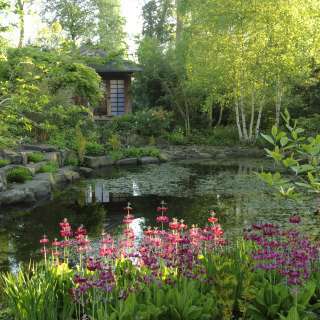 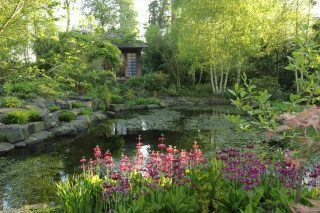 The lower pond is best contemplated from the porch of a teahouse – another nod to Japanese gardens. 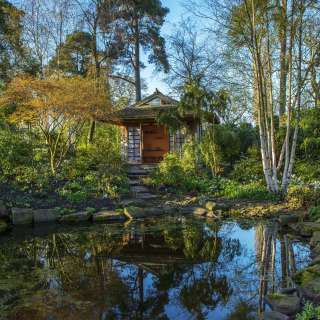 The structure is built entirely from wood, blending in with the surrounding bamboos and silver birches. 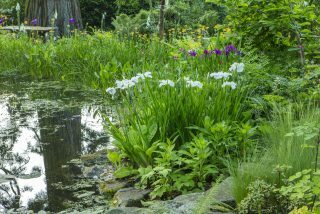 Along the edges of both ponds, meandering paths pass closely by swathes of marginal and water plants. 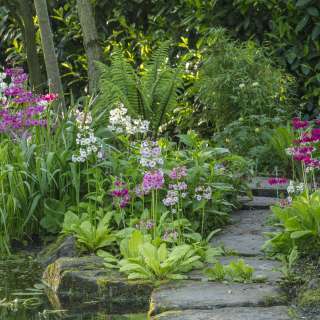 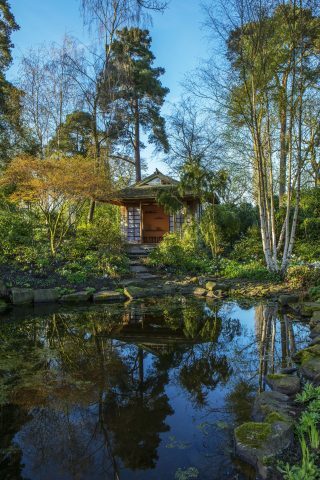 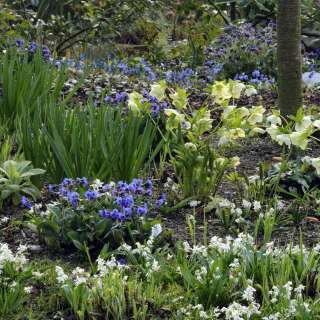 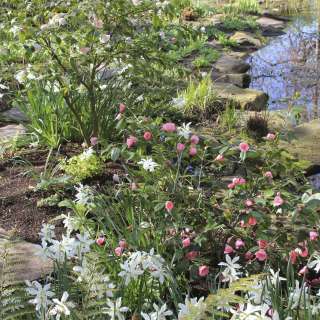 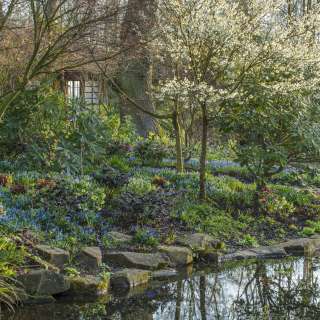 The planting throughout this serene woodland garden celebrates all seasons, beginning in early spring when drifts of blue scillas and pulmonarias, white narcissus, anemones and Japanese cherry blossoms carpet the banks and paths. 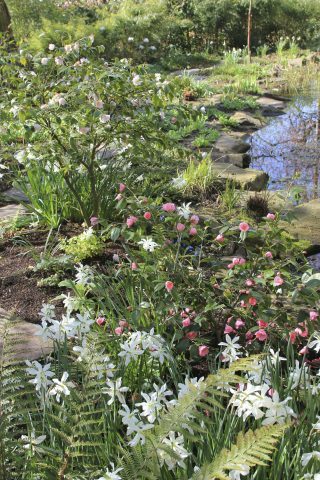 Silvery-white magnolias stand out against pastel-coloured camellias among lime green hellebores. 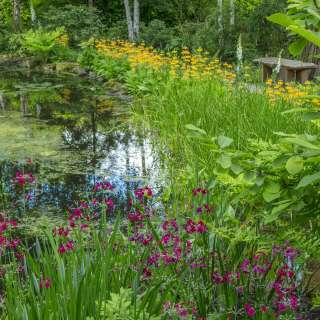 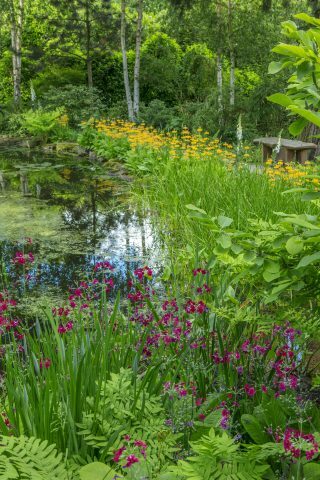 The elegant spring display is followed in late spring and early summer by a firework of brightly coloured candelabra primulas and Iris ensata. 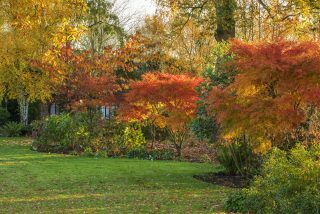 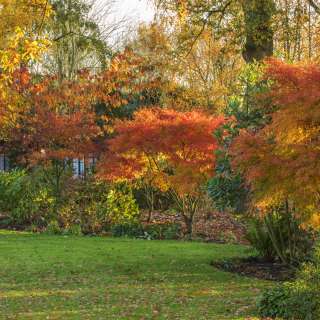 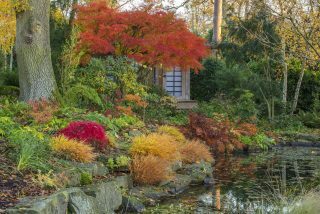 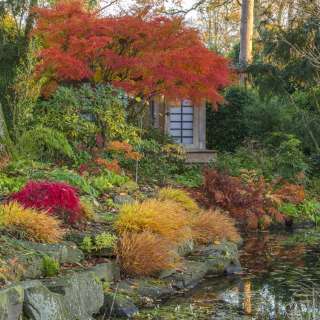 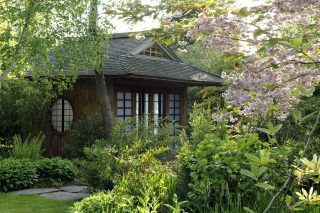 Late in the year the Japanese inspiration is strongest with the fiery foliage of Japanese acers and cherries rising among swathes of hydrangeas, hesperanthas, francoas and Aster divaricatus. 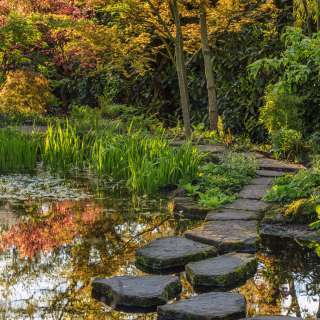 From a tiny waterfall between the upper and the lower pond, floating stepping stones take the visitor obliquely across the surface of the upper pond past white and deep red water lilies. 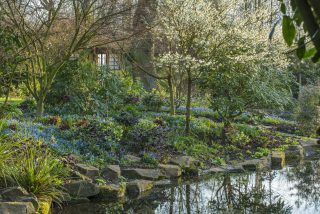 Through an archway and the dappled shade of a lofty laurel dome, the path opens to the dramatic primordial landscape of the Rockery.